Funny men Vince Vaughn and Kevin James come together in director Ron Howard’s The Dilemma, which arrived on DVD and Blu-ray on May 3, 2011, from Universal Studios Home Entertainment. With Vaughn and James, you might expect a laugh-fest ala Vaughn’s Couples Retreat or James’ Grown Ups, but instead Howard’s movie mixes comedy and drama. 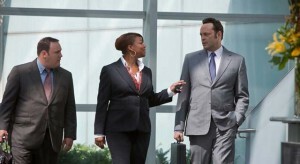 In the film, Vaughn and James are entrepreneurs under stress as they try to close a big deal. Meanwhile, Vaughn is trying to create the perfect proposal for his long-time girlfriend (Jennifer Connelly, Creation) but comes unraveled when he sees James’ wife (Winona Ryder, Black Swan) with another man (Channing Tatum, Dear John). The dilemma is whether or not to spill the beans. Queen Latifah (Just Wright) also stars. With mixed reviews, PG-13 rated The Dilemma grossed $47.6 million in theaters, a lot less than its estimated $70 million budget. The movie was priced at $29.98 on DVD and $39.98 on Blu-ray. and featurette “This is The Dilemma,” with Howard and producer Brain Grazer talking about how the movie’s premise was conceived in a restaurant in Rome. Also, the Blu-ray includes a downloadable digital copy of the movie. The digital copy has a quick five-month expiration time, expiring on Oct. 31. Blu-ray, DVD, Digital HD Release: Hail Caesar!